Let the sea sparkles fill up your heart! Boutique holiday rental apartments with breathtaking sea views. Lose your heart at Southcliff.... three idyllic holiday homes perched on a cliff top overlooking the glorious North Sea. Located in the fishing village of Cullercoats, just 5 mins to Whitley Bay and a 10 min stroll to Tynemouth , in this beautiful conservation area. There is kayaking, cycling, paddle boarding at the rear of the apartments, and quirky bars and cafes round the corner. 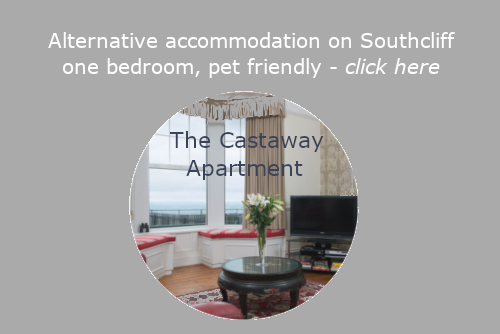 They're an ideal choice for visiting relatives, a romantic break or a short break by the sea ... with the warmest of Geordie welcomes! We're open all year and are family friendly and Bay View apartment is Dog Friendly. Apartments let Sat-Sat with winter short breaks. Ask about longer term rentals too ! Watch our video to see why our guests come back year after year ... and how we are proud to play our part in caring for this unique coastal environment and eco system. Availability/Tariff - just Click Here.